The Cincinnati Bengals defeated the Indianapolis Colts on Sunday afternoon, 34-23, during the NFL’s first full Sunday of action. Wide receiver John Ross took a big step in putting his troubled rookie season behind him by snagging a fade route from Andy Dalton for his first NFL touchdown. The Bengals made it clear that running back Joe Mixon is the focal point of their offense. Mixon started at running back and also saw several pass targets. Mixon’s speed and open-field running ability made him a dangerous weapon for the Bengals in this game. The Colts were shorthanded at offensive tackle coming into today’s game and it showed. Edge defender Carlos Dunlap was the chief benefactor, as he was essentially unblockable coming off the edge on pass rushes. 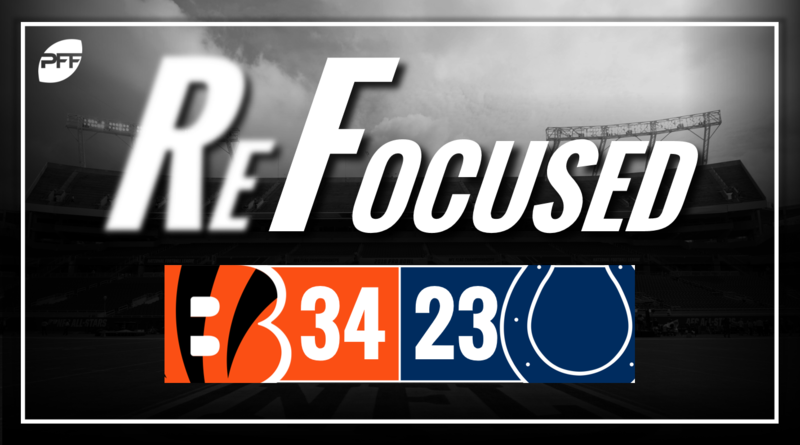 Bengals safety Clayton Fejedelem was picked on throughout the game by the Colts crossing-route-heavy offense, but he secured victory for Cincinnati by ripping out what would have been a first-down catch by Colts tight end Jack Doyle. The fumble was returned to the house for a long defensive touchdown. This was not the debut the Colts were hoping to see from 2018 first-round pick Quenton Nelson. Starting at left guard, Nelson had a number of downgrades in both run-blocking and pass-blocking, and he particularly struggled in space when asked to pull or get to the second level. Quarterback Andrew Luck got away with a couple of ill-placed balls (as he is prone to doing), but the Colts have to be encouraged by his performance today. He did an excellent job of manipulating an often-muddied pocket and flashed his playmaking ability on throws to all parts of the field. Edge defender Margus Hunt had the most productive pass-rushing day of his career as he ended up with two sacks. Rookie edge defender Kemoko Turay showed off his quick first step and was able to generate some pressure off the edge, an aspect of the Colts’ defense that has been sorely missing. The Colts just didn’t have the depth on the offensive line to hold up against the impressive rotation the Bengals rolled with on their defensive front.